Multi Trust now operates four restaurants in Ho Chi Minh City and its first franchising deal in Malaysia brings its total to seven, together with two other franchises in the Mekong Delta’s Can Tho city, which opened last December, and in Hanoi, to be re-opened in August. Lion City is the first five-star Singaporean restaurant chain in Vietnam, serving famous Singaporean fare to an average of around 60-80 customers at each outlet every day. “We import about 70 per cent of ingredients and materials for the Lion City chain in order to ensure quality and authentic taste,” Founder Mr. Harry Ang told VET. The company has also set strict criteria for its franchising partners, who must have strategic and prime locations with a minimum dining area of 200 sq m and investment capital of $200,000. Lion City’s venture into the franchising playground overseas is a strategic move after more than a decade of development in Vietnam. “We are considering franchising in Da Nang and Nha Trang and our next target country after Malaysia is Thailand,” Mr. Ang said. With a wide variety of offerings, long-term Vietnamese restaurant chain operator the Redsun International Trading Investment Corporation (Redsun ITI) now has 14 renowned brands with nearly 200 restaurants throughout the country after being founded in 2008, in which 31 are franchises. 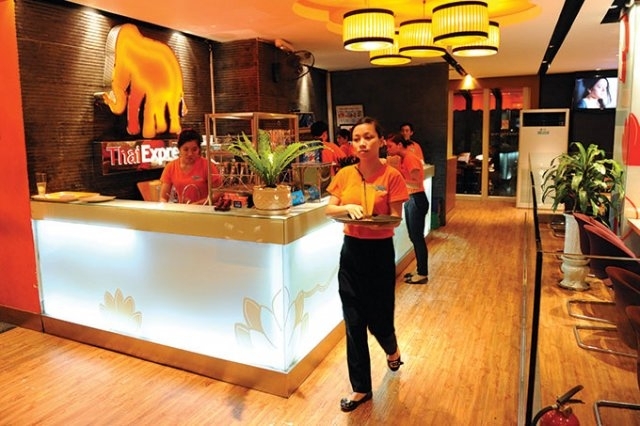 The company affirms its leading brand in Vietnam’s F&B sector in serving more than 5 million customers per year. According to Mr. Le Vu Minh, Deputy General Director of Redsun ITI, the company will open and franchise more restaurant brands in Vietnam as well as in other countries this year and the years to come. “We have franchised with King BBQ and Hotpot Story and are now proceeding with Buk Buk and Khao Lao,” he said. Another active restaurant franchisor, Redwok, earlier this year announced its second franchised Wrap&Roll restaurant in Shanghai, China, raising the total number in Asia to six. This is part of the company’s expansion plans in five foreign countries from now to 2021. It now has three Vietnamese restaurant brands with 25 outlets nationwide and six franchises in Singapore and Shanghai. The company will open 10-12 new franchising stores overseas this year. Apart from local brands, foreign F&B giants have been looking at different ways to franchise their brands in Vietnam. Popular instant noodle maker Acecook Vietnam two months ago signed a commercial franchise agreement with Japanese restaurant brand Ringer Hut to operate a restaurant chain in Vietnam. It is preparing to launch the first noodle restaurant this year. The restaurant chain model possesses advantages that will see franchises grow, but it will depend on the characteristics of each business model and the ability of the owners, according to Mr. Dao The Vinh, CEO of the Golden Gate Group (GGG). “Vietnam is relatively new in terms of franchising, and awareness is low and the legal framework is still being built, so limitations remain,” he said.